Erica Flores Baltodano has nearly 20 years experience as an attorney and policy advocate in the areas of civil rights, social justice, and employment law. After practicing law for nearly a decade in Los Angeles, Ms. Baltodano relocated to the Central Coast of California in 2010 and became Managing Partner of Baltodano & Baltodano LLP, a plaintiff-side employment law firm she founded with her law partner husband. In November 2017, Ms. Baltodano’s law partner became a California State Superior Court Judge and Ms. Baltodano became President of The Baltodano Firm, A Professional Corporation. In January 2017 Ms. Baltodano delivered the keynote address at the First Annual Women’s March in San Luis Obispo, in February 2018 she was recognized by the San Luis Obispo County Commission on the Status of Women, and in March 2019 she received the 2018 Outstanding Woman Lawyer Award from the Women Lawyers Association of San Luis Obispo County. She currently serves as Board President of San Luis Obispo Legal Assistance Foundation and as a Board Member of the San Luis Coastal Education Foundation, among others. In 2019, Ms. Baltodano began teaching Constitutional Law at San Luis Obispo College of Law. Ms. Baltodano graduated from UCLA (B.A. Sociology and Public Policy) and UC Berkeley School of Law (J.D. ), where she received the prestigious 2002 Francine Diaz Memorial Award for her steadfast commitment to public interest law. Today, as an attorney, law school professor, and writer, Ms. Baltodano remains committed to social justice, advocacy, and education. Ms. Baltodano began her legal career at the Center for Law in the Public Interest, one of the nation’s first public interest law firms, advocating on behalf of economically disadvantaged and traditionally under-served children and communities. 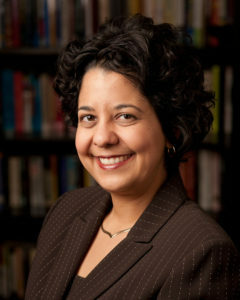 A recipient of a Selected Professions Fellowship from the American Association of University Women Educational Foundation and Minority Fellowship in Environmental Law from the American Bar Association and the State Bar of California, Ms. Baltodano focused her initial professional work on cutting-edge environmental justice and civil rights issues. After just a few short years of practice, Ms. Baltodano assumed the role of Assistant Director and Counsel at the Center for Law in the Public Interest where her work helped to shape, guide, and manage the legal and policy work of The City Project. At the City Project, which spun-off and became a stand-alone legal non-profit organization, Ms. Baltodano influenced the investment of billions of dollars in public resources (parks, schools, beaches, transportation) to enhance human health and the environment and promote equality and economic vitality for all communities. In 2010, Ms. Baltodano co-founded and served as managing partner of Baltodano & Baltodano LLP, The Baltodano Firm’s predecessor employment law firm on the Central Coast for seven years, receiving the Access to Justice Advocate award from San Luis Obispo Legal Assistance Foundation in 2017 and recovering tens of millions of dollars on behalf of individual and class member employment law clients. Ms. Baltodano’s diverse personal background, exceptional communication skills, and professional experience hiring, training, coaching, evaluating, and mentoring staff enhances her approach to the practice of employment law. Further strengthening her skill set, Ms. Baltodano has extensive cross-cultural mediation training and training from the Midwest Academy for results-oriented social action and organization building. Ms. Baltodano is a bicultural woman who is skilled and comfortable negotiating the complexities of human conflict and relations. Today, Ms. Baltodano builds upon a rich history of litigation and social justice advocacy at The Baltodano Firm, A Professional Corporation. She remains committed to positively impacting the lives of her clients, and the community more broadly, through litigation, advocacy, and education. See below for details regarding Ms. Baltodano’s Board Memberships, Community Engagement, Awards, Publications, and Public Speaking Engagements. Erica Flores Baltodano has been widely recognized for her steadfast commitment to service and education in our community. For example, in March 2019, she received the 2018 Outstanding Woman Lawyer Award from the Women Lawyers Association of San Luis Obispo County for her active promotion of the advancement of women in the legal profession and in the community. In 2018, Ms. Baltodano was honored by the San Luis Obispo County Commission on the Status of Women for her exemplary contributions toward bettering the lives of others through hours of invaluable service to the community. On account of her lifelong work for social justice, environmental justice, and workers’ rights, Women’s March San Luis Obispo invited Ms. Baltodano to deliver the keynote address at its First Annual Women’s March in January 2017. Ms. Baltodano has served on the Board of Directors of San Luis Obispo Legal Assistance Foundation (SLOLAF) since 2017 and is now serving in the role of Board President. SLOLAF provides free legal services to San Luis Obispo County seniors, veterans, and families in need. She is also a member of the National Advisory Council for The City Project, a Los Angeles-based civil rights and environmental justice organization she helped found, which works to achieve equal justice, democracy, and livability for all. In addition, Ms. Baltodano serves as an adviser to the Superintendent of San Luis Coastal Unified School District (SLCUSD), as a member of the Common Ground Advisory Task Force, which makes common ground recommendations for school district programs, policies, and practices regarding controversial issues in order to foster civil discourse and improve school conditions for all students. Ms. Baltodano is also a founding member of the newly formed San Luis Coastal Education Foundation, which seeks to partner with the private and public sector to support creative and innovative programs to enrich and provide equitable opportunities for San Luis Coastal students across the District, particularly in the wake of diminished funding caused by the Diablo Power Plant Closure. In January 2019, Ms. Baltodano began teaching Constitutional Law at San Luis Obispo College of Law, an accredited branch of Monterey College of Law. Consistent with her passion for education, Ms. Baltodano regularly facilitates field trips and conducts related civic lessons for local elementary school children, including visits to City Hall and the City Council chambers, the SLO County Government Building, and SLO County Superior Court. She is also a frequent speaker in elementary, high school, and university classrooms, as detailed under the Speaking & Teaching Engagements section below. In November 2017, Ms. Baltodano’s law partner husband was appointed by the Governor of the State of California to become a Superior Court Judge. Although he was appointed after nearly a year of intense state-wide vetting, the timing of his appointment also required him to run for election in June 2018. Ms. Baltodano served as Campaign Manager for the campaign to Elect Judge Baltodano 2018, ensuring a landslide 65-35 victory for her husband who now serves as the only local Superior Court Judge to be both appointed and elected. Ms. Baltodano has since served as an advisor to other local campaigns, including City Council and School Board. Ms. Baltodano previously served as a board member for the organization formally known as the San Fernando Valley Girl Scout Council, Casa Cardenas, a San Gabriel Valley-based organization that provides mental health services to Latinos, San Luis Obispo MOMS Club (Moms Offering Moms Support), and UMCC preschool in San Luis Obispo. In 2015-2017, Ms. Baltodano served as co-chair of a successful annual fundraising campaign for a local PTA. A generous supporter of several local non-profit organizations, Ms. Baltodano is proud to contribute toward the work of those who make our community a safer, happier, healthier, and more compassionate place for all. In 2016, Ms. Baltodano was awarded the Frank J. Pentangelo Award for her creative contributions to the San Luis Obispo County Bar Association’s Bar Bulletin. In an 11-part series of essays called Mommy Esquire, Ms. Baltodano merges lessons in the law with lessons in parenting and explores issues of race, gender, and inequality. The series creatively draws upon her experience as a parent, attorney, business owner, and woman of color. She is currently working toward publication. Mommy Esquire, 11-part series of essays in San Luis Obispo County Bar Bulletin (San Luis Obispo County Bar Association, 2015-2017). Hold Coastal Commission Accountable in Recognizing Civil Rights, Special Contributor, The Sacramento Bee (March 5, 2016). Anatomy of the Urban Park Movement: Equal Justice, Democracy, and Livibilty in Los Angeles, in The Quest for Environmental Justice: Human Rights and the Politics of Pollution 145 (Robert Bullard, ed., 2005) (with Robert García). We Shall Be Moved: Community Activism as a Tool for Reversing the Rollback, in Awakening From The Dream: Pursuing Civil Rights in a Conservative Era 329 (Denise C. Morgan et al., eds., 2005) (with Robert García). Free the Beach! Public Access, Equal Justice, and the California Coast, 2 Stanford Journal of Civil Rights and Civil Liberties 142 (2005) (with Robert García). Healthy Children, Healthy Communities, and Legal Services, 52 Clearinghouse Review Journal of Poverty Law and Policy (special issue on Environmental Justice for Children) (May-June 2005) (with Robert García). Healthy Children, Healthy Communities: Schools, Parks, Recreation, and Sustainable Regional Planning, 31 Fordham Urban Law Journal 101 (2004) (Symposium on Urban Equity) (with Robert García and Sophia Mei-ling Chang). Book Review, Global Critical Race Feminism: An International Reader, Edited by Adrien Katherine Wing (New York University Press, 2000) in 16 Berkeley Women’s Law Journal 2017 (2001). “Personal and Professional Lessons from a Social Justice Advocate,” Guest Lecturer, San Luis Obispo High School (Feb. 2017, Feb. 2018, and Feb. 2019). “How to be Persuasive (Like a Lawyer),” Presenter, San Luis Coastal Unified School District 5th graders (March 2017). “Latinas & Education,” Co-Facilitator, Forum Sponsored by Latino Outreach Council (Feb. 2017). “Persuasive Speech: Lessons from a Legal and Policy Social Justice Advocate,” Guest Lecturer, California State Polytechnic University, San Luis Obispo, COMS 102: Principals of Oral Communication (May, 2016). “How I Use Persuasive Writing in My Job,” Presenter, San Luis Coastal Unified School District 3rd graders (2015, 2016). “Doing Well By Doing Good: Public Interest Layering in the Non-Profit and Private Law Firm Setting” Guest Lecturer, California State Polytechnic University, San Luis Obispo, Political Science 245: Judicial Process (November, 2014). “The City Project: Impact Litigation and the History of Environmental Justice Issues in the Los Angeles Area” Guest Lecturer, California State University, Los Angeles, Environmental Policy, Law, and Society (June, 2005). “Green Access & Equity for the San Diego Region,” Presenter, City of San Diego, Parks and Recreation Department, Open Space Division, Quarterly Meeting (April 2010) (with Seth Strongin). “Equal Access to California’s Public Beaches,” Guest Lecturer, Environmental Law Society, USC School of Law (Feb. 2004). “The Cornfield & Taylor Yard: Bringing the First State Parks to Urban Los Angeles,” Guest Lecturer, California State University, Long Beach, Outdoor Recreation Resource Management (Sept. 2003). “A Coastline for All: Latinos, California, and Our Beaches,” Panelist, 1st Annual California Latino Environmental & Natural Resources Conference, Sacramento, CA (Oct. 2002).